Today I visited a local museum. Most of the works of art were at least a few hundred years old, some dating back a further few hundred years. There were paintings by Degas, Monet, Van Gogh, Vermeer and a vast collection of other preeminent artists. Beyond the beauty and craftsmanship, I was struck by the expressions on the faces of the people depicted. Such depth and melancholy, such longing and vulnerability…these characteristics were common among every subject. It got me thinking that, for all of our advancements in technology and for all of our extensive knowledge and education, we remain today as hopelessly unaware of the true meaning of our existence here on earth and as susceptible to grief, despair and soul crippling romanticism. And, I felt both comforted and unnerved by the realization that, no matter how much time passes or how much we think we know, we are living and reliving the same cycles as our predecessors. It is the human condition…that we must find purpose enough to engage in life and do the hard work of surviving and hopefully thriving while at the same time we must detach to some extent in order to accept our mortality and the fleeting nature of our time here for what is a very small blip in the scheme of things. That pieces of art can have such soul and communicate such explicit feelings reassures me that there is some sense to all of this, that there is energy beyond just this current moment…some sort of eternal life or thread of consciousness that sustains over hundreds and thousands of years to infinity. I am waxing philosophical here. That’s what art does to me! I love it. I am at once humbled, reassured and stupefied. 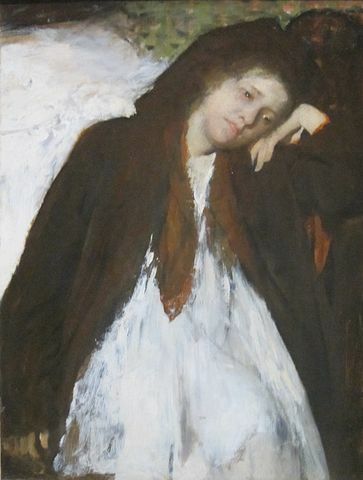 This entry was posted in Coping, Uncategorized, Uplifting and tagged Art, Degas, life, meaning, purpose, The Convalescent by SurvivingLimboGirl. Bookmark the permalink.